This page collects a small sampler of QDOS software for use on QLs and emulators. This is the most common format for distributing QL software. Binary programs that are launched with the EXEC/EXEC_W command store special metadata outside the binary itself (executable flag and data space). Only the QDOS versions of the zip and unzip programs can write and read the QDOS metadata. Unzipping en executable with the Windows version of unzip would discard the metadata and the EXEC_W command would fail with error 'bad parameter'. Directly attach a microdrive slot to the .zip file and run from there. No need to unzip the file first because Q-emuLator can directly read from QDOS zip files. Unzip the file to a Windows directory first, either by using the QDOS port of the Unzip program, or by copying the files from a microdrive slot attached to the .zip file to a microdrive slot attached to the Windows directory. This is a new format supported by Q-emuLator. 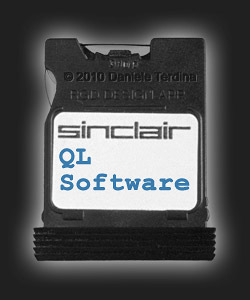 A single .qlpak file contains all the QL files needed to run a QDOS program and optional Q-emuLator settings (for example a .qlpak may limit the amount of RAM to 128 KB if the software in it only works on unexpanded QLs). You can run the software just by clicking on the web page .qlpak links (assuming Q-emuLator is installed on your machine). If you download a .qlpak, you can run it by double-clicking on it, or you can attach .qlpak files to microdrive slots. Note: If the latest version of Q-emuLator for Windows is installed on your PC, you can directly execute .qlpak files from this web page by clicking on the link and choosing 'Open'. Psion Chess 1.0 was one of the first games for the QL. Written by Richard Lang, it offered good gameplay at the time, and a 3D chessboard. The .qlpak contains settings to emulate an unexpanded QL and to run at 'QL speed' to be able to see the QL start-up 'dots'. To run the program in demo mode (computer vs. computer) and in 3D, press F2 and 'd'. The game files were copied from the original copy-protected microdrive using the MdvToWin_exe utility to preserve the hidden protection information and allow Q-emuLator to simulate the original microdrive. Psion also released the game for many other systems and the DOS version can be played online. © 1984 Psion LTD, later released by Psion as freeware. TwoScreens is a simple SuperBASIC program that shows the ability of the Minerva ROM to use both of the QL screens. The QL's hardware has two video pages, but QDOS can only use the first one (although some games disable QDOS to take advantage of the second screen). Minerva is a QDOS-compatible ROM with many enhancements, including the ability of using both screens from SuperBASIC. This demo program draws random rectangles in Mode 4 on the first screen and circles in Mode 8 on the second screen. Press Ctrl+Tab to alternate between the two screens. © 2008 Daniele Terdina, Freeware. Q60 demo is a little demo I wrote to showcase emulation of the Q60 display. The demo runs at a resolution of 1024x512, 65536 colors. It shows an animated 3D landscape computed in real time, two slide shows, and a little animation all running at the same time. This is a full screen demo, press ESC to exit. © 2007 Daniele Terdina, Freeware. 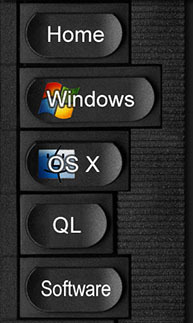 QLPUI is a prototype of a modern GUI for QDOS, running on a Q60 video card. This is a QDOS port of the DEPUI project. QLPUI provides a desktop, mouse pointer, window environment, window themes and scalable fonts (select font -> load -> replace *.pcx with font_pcx -> OK -> OK). This package also includes a text editor. Note that QDOS is not able to take advantage of the Q60 display, so these graphics modes can only be used by programs that directly access the Q60 video memory or by SMSQ/E. © 2007 Peter Graf, Freeware. GST 68K/OS GST was commissioned with writing the QL's operating system, but in the end Sinclair decided to use the internally developed QDOS. GST later released their OS as a 32 KB ROM for the QL. Start by pressing one of the F1-F5 keys. 'ADAM' is the name of the command interpreter. To create a second interpreter instance (as an example), type ADAM and press ENTER. To delete the second interpreter, press ALT+F1 followed by SHIFT+F5. For more information, read the user manual. Unfortunately, most of the other 68K/OS commands came on a microdrive with special formatting (this QLPAK only contains the ROM). © 1984 GST Computer Systems Ltd., released as public domain in 2010. After pressing F1 or F2, this demo automatically loads Lynx and directs it to www.google.com. Press the down arrow until the cursor moves to the search text field. Type what you'd like to search and press the Enter key twice to submit the form and load the page with the search results. Press the down arrow key until you arrive at one of the result links and press Enter to follow the link. Circles is a short SuperBASIC program that draws concentric circles with 65536 colours in SMSQ/E and using the 1024 x 768 graphics mode of Q-emuLator. This is a full screen demo, press ESC to return to windowed 512 x 256 graphics mode. Demo © 2010 Daniele Terdina, Freeware. SMSQ/E © 1989-2013 Tony Tebby and others, see the free licence. You can find QL software and documentation at Dilwyn's QL page. Tne QL Wiki has descriptions for many QL software titles. Spook is a Pacman-like game for the QL (also available as ZIP). © 1985 Damon Chaplin, now public domain. Q-emuLator includes a few ROMs, and if you have a QL you can save the ROM to a floppy disk and install it in the emulator. Sinclair ROMs are named after the version that you get with the command 'PRINT VER$'. In chronological order, the most common version are AH, JM, JS and MGx, where MGx are the localized ROMs (e.g. MGG for German and MGI for Italian). 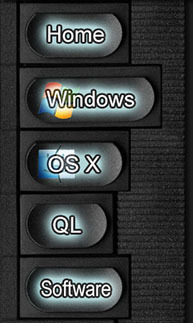 Minerva is a QDOS-compatible operating system that also was distributed as 48KB QL ROMs. It is faster than the original QDOS, and includes a number of enhancements (for example a full-screen SuperBASIC editor and the possibility to use both of the QL video memory pages). Some time ago Tony Firshman made all versions of Minerva up to 1.89 public domain, and more recently Laurence Reeves (the author of Minerva) made all versions public and released the source code for the latest version under the GPL license. Download Minerva ROMs version 1.61, 1.63, 1.64, 1.66, 1.76, 1.82, 1.89, 1.93, 1.97. You can find the latest Minerva ROM (1.98) and all of its source code on Laurence Reeves' web site. Good ROMs to use in emulators are the Sinclair JS ROM and the Minerva 1.97 ROM. Dilwyn Jones also has a QL ROM web page where you can find more ROMs, including some non-standard ROMs. SMSQ/E is an operating system written by Tony Tebby, the author of the QL's operating system. SMSQ/E is for the most part compatible with QDOS, but greatly expands it. For example it contains the Toolkit II commands, it includes the pointer environment and window manager, adds support for directories in the file system and can use graphics displays with higher resolution and more colours than the QL. SMSQ/E has been re-released in January 2013 with a free licence. The recommended Q-emuLator version supports screen resolutions of up to 1024 x 768 with 16 bit colour. Make sure you enable Q60 display emulation in the configuration options. In the SuperBASIC interpreter type 'LRESPR win1_SMSQ_QEM' to start SMSQ/E, then ' 'DISP_COLOUR 3,1024,768' to enter the high resolution mode and 'DISP_COLOUR 0,512,256' to exit it. The version for the Gold Card QL board and Aurora video card. This page © 2013 Daniele Terdina. All rights reserved.